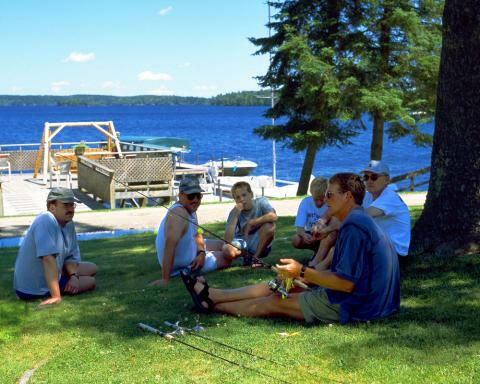 Each week from early June to late August one of our skilled fishing guides will make a brief presentation about Lake Vermilion fishing. Guides touch on all the basics to give you a great introduction to the Lake. Each week the water temperature and weather conditions change resulting in a need to change your fishing tactics. Who better to keep you abreast of current conditions than a seasoned guide with many years spent on the water. Guides touch on all the favorite fish species and what techniques are currently most effective. They also allow time for questions and answers to tailor the discussion to your needs. Though it is best to prearrange your guide dates before your vacation, this can also be a good time to book additional guide dates for your vacation. Here Doug Knoer gives guests some tips on spinner bait fishing in the shade of our front lawn.